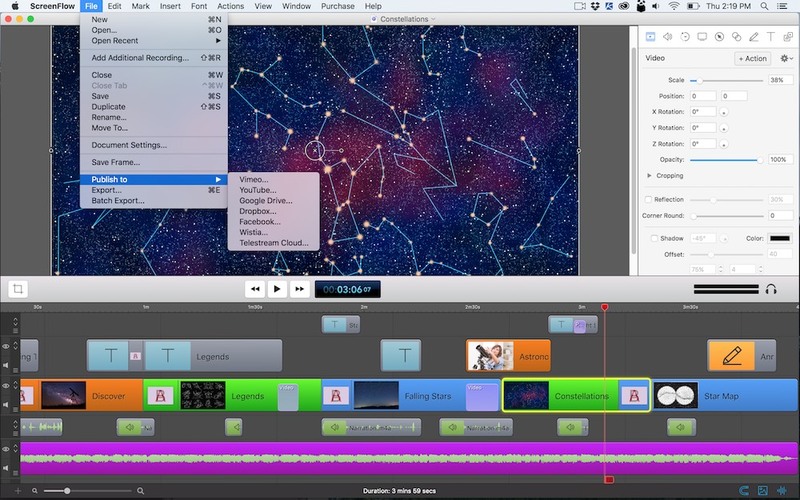 ScreenFlow is powerful, easy-to-use screencasting software for the Mac. With ScreenFlow you can record the contents of your entire monitor while also capturing your video camera, microphone and your computer audio. The easy-to-use editing interface lets you creatively edit your video, and add additional images, text, music and transitions for a truly professional-looking video. The finished result is a QuickTime or Windows Media movie, ready for publishing to your Web site or blog or directly to YouTube or Vimeo. Use ScreenFlow to create high-quality software demos, tutorials, app previews, training, presentations and more.